Evo & Grace: The WanderLusts: Stagers successfully conquer the Big Dome. Philippine Stagers Foundation at the Araneta Coliseum. 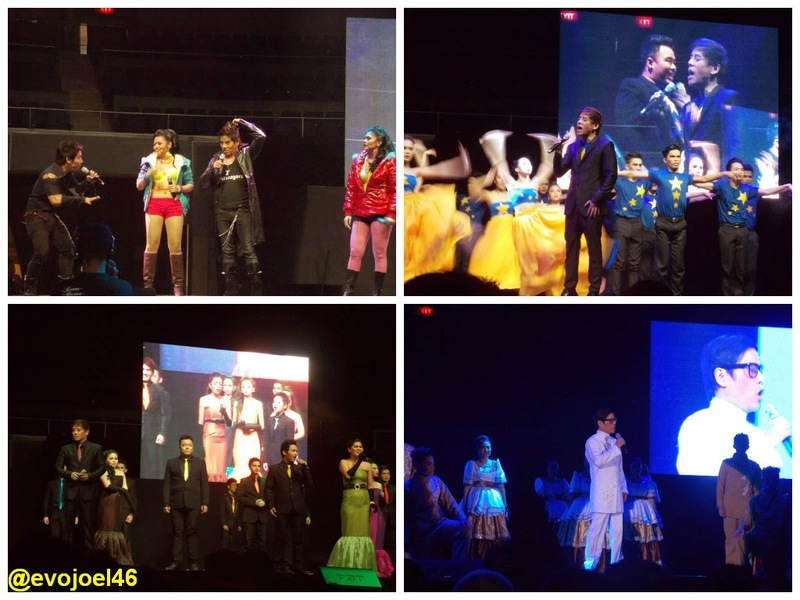 Atty.Vince Tanada and his Philippine Stagers Foundation can now breath and relax happily, this is due to the successful first ever major concert of the Stagers at the Araneta Coliseum last Nov 24, 2014, wherein they fill the 15,000 seats of the big dome with flying colors, to think the show is slated on a Monday event and not the usual weekender show. The concert features more than 70 plus members of then and now Stagers along with its founding members wherein they were called Dulaang Bedista Alumni Production 14 years ago, actually the Concert is an anniversary offer of Stagers to their supporters who stood to them until now. For the record they are the first ever theater company in the Philippines who bravely held a concert in the big dome. Glimpse of Stagers at the Big Dome. The two hour concert mainly give chances to Stagers in performing songs and dance they don’t usually does, from the likes of Beyonce’s to J.Lo, and of course Original Pilipino Music shines as well from Eraserheads to the Dawn hits. But what the audiences love most is those impersonations number of male stagers acting ladies and mimicking the original singers such as Bang bang song of Jessie J, Ariana Grande and Nicki Minaj. Lovely musical indeed, with the musical sound like that of the ibanez george benson. Excerpts of PSF past plays from Ako si Ninoy to Cory ng Edsa, Joe:The Rocksical to Bonifacio: Isang Sasrwela is also perform in Araneta in full production with grand costume changes, also broadway classics from Les Miserables and Cats is given justice as well by the stagers. A mini fashion show is also featured in the show with models from Elites Model Management of Martin Martin. The show indeed is a grand feels like you’re watching the Sunday variety show “ASAP” of ABS-CBN. Cindy Liper's Let It Go number. Tanada’s mentor Playwright Frank Rivera and Film Director Elwood Perez is present in the audience to show support for Tanada. Perez latest film “Esoterika Manila” was the opening movie of the recently concluded Cinema One Original Film Festival that stars Tanada along with others stagers. After the said concert, PSF excitement is still high due to the five nominations they receive from Aliw Awards for this year, their latest and ongoing play “Filipinas 1941” is nominated for Best Musical Production, while Patrick Libao, Cindi Liper, Chris Lim and Adele Ibarrientos are all cited for best performances in the said play, results will be revealed on Dec 1 at Resorts Worlds Manila during the awarding ceremony of the said award giving body who now turn 27th year. And Filipinas 1941 is being played nationwide by the Stagers up to July 2015. For Tanada, he is scheduled to attend next month the Hanoi Film Festival where his first film “Otso” directed by Perez as well is in competition, he is also into recording now for a forthcoming album set to release next year. This looks like it was a great show! I can't imagine the nerves the performers had for being in front of a large audience like that. This sounds like a great concert/show. I don't think I could get up and perform in front of a large crowd. Glad their show went well. Sounds like it was a good one. I like that there is a variety of performances. Makes it entertaining. This sounds like it was a wonderful concert! It must've been a lot of fun to be there and experience it in person! Wow! This looks so cool! :) What a lovely concert!! Looks like it was a great show! I'd love to have a night out seeing something like this. This looks like it was a fun show. The history of the Stagers is cool too! That's awesome that they got so many nominations.It looks like a great show! Sounds and looks like an awesome show indeed. Kudos to them for being the first dance group in the Philippines. Thanks for sharing. There is nothing like a live performance! That looked like you had a great time! I would have loved all the singing and dancing. I wish I could have seen the dance performances. I bet they have a lot of talent to be able to mimic so many talented performers. It sounds like an awesome show and it is great that this is the first group of their kind in the Philippines. Looks like a great show indeed. With a fashion show too! OMGoodness...this looks like so much fun to go see. I love dancing and singing and performances like this. I would have loved to have gone to something like this. Great shots of the perfomances...I like the wardrobe. It was such a successful show! I wish I could have seen it myself. I would love to attend something like this. I love that it lasted 2 hours. Sounds like a really great time! The show looks like it was amazing! I would have loved to see a video of some of the performances!